Isaac has been begging me to let him sew for almost two years. Since one of his activities for this year was cancelled, I decided this may be the time for him to learn to sew. I talked to my instructor and she agreed to give him lessons as well. He now goes with me once a month and has his lesson at the same time as I do. 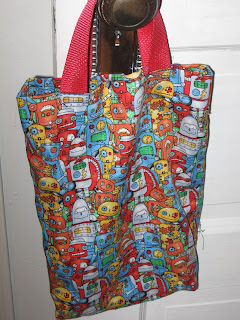 At his first lesson he created this robot bag. I was pretty impressed. Here he is practicing making straight seams before he sewed his bag. 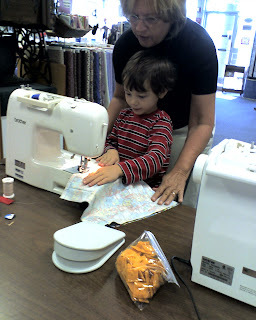 He can stand while he sews because my machine has a button you can use if you detach the foot pedal. 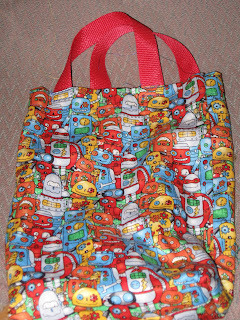 Since the lesson he has begged to sew everyday and created another little pouch. If he really gets into this I may set up an etsy shop for him to sell his wares. I'm impressed...and feel a little guilty because my girls have asked for me to teach them how to sew, and I haven't done anything about it :( :( Thanks for the encouragement!